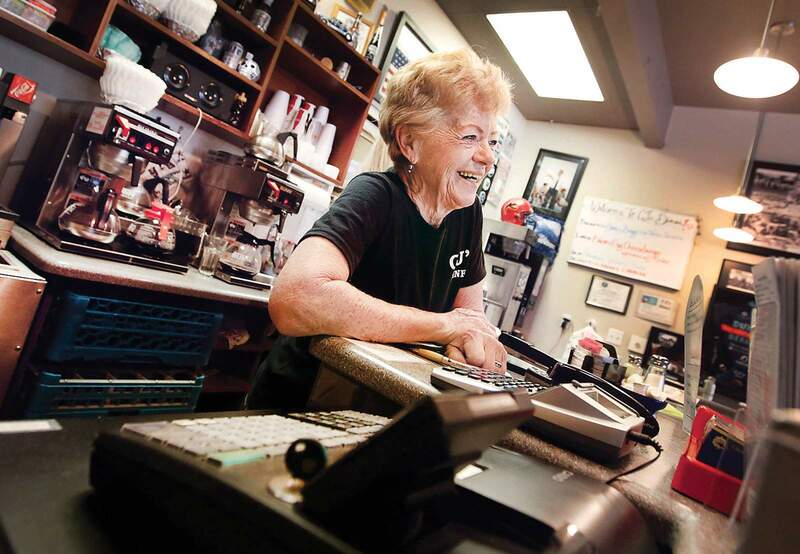 Janie Wilson, who has been waiting on tables for 52 years in Durango, always has a smile for her customers at CJ’s Diner. Janie Wilson doesn’t plan to retire soon. She said her work keeps her in shape and up to date in a fast-changing world. 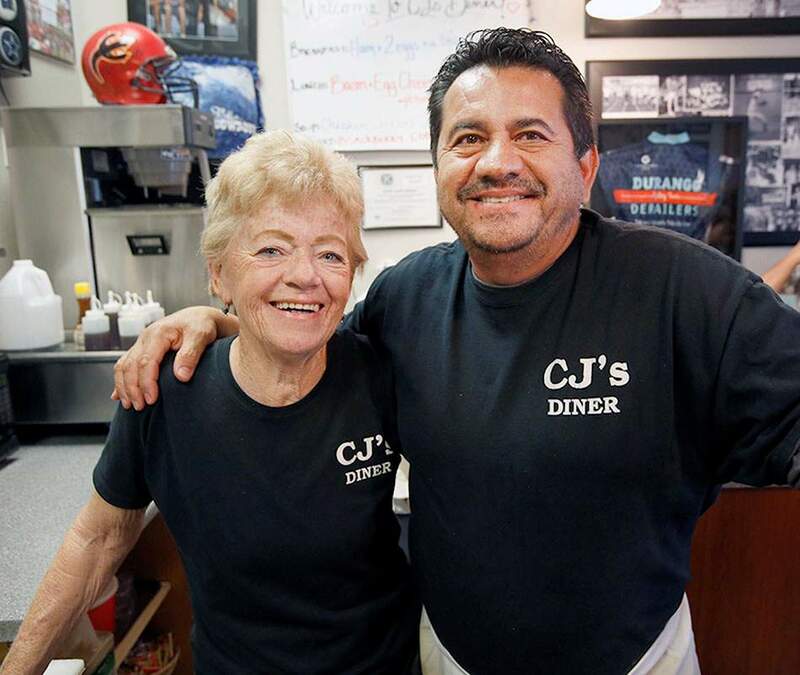 Janie Wilson and her brother-in-law, Jerry Martinez, owner of CJ’s Diner, where she has been working since 2001, have worked together in restaurants for 40 years. 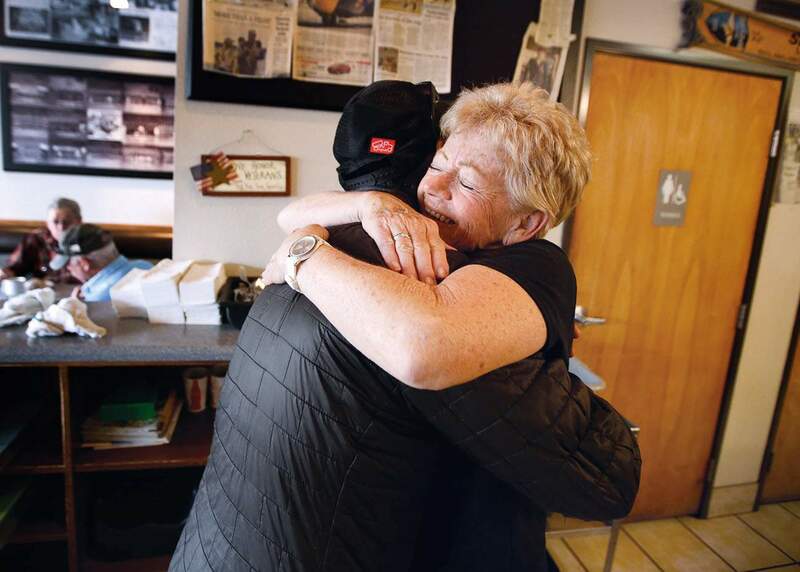 Janie Wilson gives Marcus Chavez, one of her regular customers, a hug on Wednesday at CJ’s Diner. If you’ve been in Durango for any length of time, there’s a good chance you’ve been served a meal by Janie Wilson. 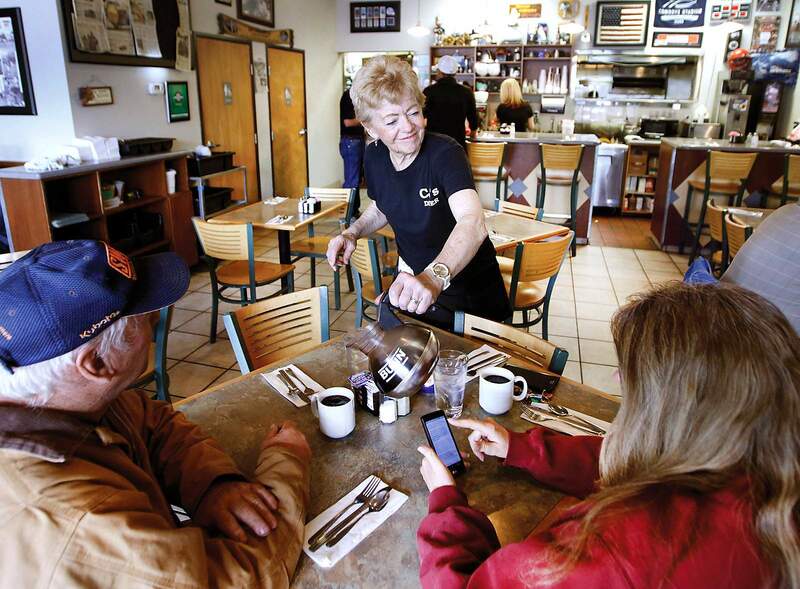 She’s been waiting tables in Durango for the past 52 years. Her latest outpost, where she has served eggs, bacon and burgers since 2001, is CJ’s Diner, 810 East College Drive, which is run by her brother-in-law, Jerry Martinez. “I just love it. You’ve got to love it to do it as long as I have,” Wilson said. Wilson can’t quite claim to be a native Durangoan. She was born in Nebraska and moved to Durango with her family as a 10-month-old. But since she’s been old enough to hold an adult job, she’s been waiting tables in town. Her first stop was Richard’s, a long-departed establishment in the building now occupied by San Marcos Mexican Restaurant. Her longest run was 24 years at Lori’s Family Dining, a restaurant that operated where Doughworks is now. She also spent nine years at the Villa, a restaurant once located across from the current Durango School District 9-R bus barn on Colorado Highway 3. Wilson’s large family – four brothers and seven sisters – formed much of the core of the ranks at Lori’s. Seven of the girls and her mother worked there. Her current stint, beginning in 2001 at CJ’s, a 17-year run, is pretty impressive by itself. Tom Townsend and Alan Benefield describe themselves as “Wednesday regulars” at CJ’s. “We don’t even have to order,” Townsend said. Always greet people when they walk in – even if you’re busy, give them eye contact and say you’ll be right with them.Always smile.Always stay a few steps ahead of the diners, anticipate their needs. This will save you when it gets busy.Always remember who is right: the customer. Although she admits, “I’ve had to swallow hard a few times.”The real key, she said, is to have honest conversations, to give everyone the benefit of the doubt and to make it your mission to pick people up.“The best thing in the world is to have someone leave with a smile on their face after they’ve been having a down day,” she said. Katerina Garcia, who began waiting tables years ago at CJ’s, said the greatest thing Wilson taught her was to have patience with customers and to smile. Wilson has a degree from Fort Lewis College in elementary education, but she said when she graduated, teachers were being laid off in Durango and she didn’t want to move. She decided to wait tables for a year and check the job market after that. Instead, she fell in love with waiting tables. She says her 52-year stint was never a conscious decision, simply something she enjoyed, and only every so often thought about checking out the inside of a classroom. Martinez attributes his sister-in-law’s success in waiting tables to her gift for the gab. “It’s not about getting food to the table. It’s about talking to the customers. She’s personable,” he said. Wilson and Martinez have worked together in restaurants for 40 years, a streak punctuated with a scare two years ago when Wilson suffered heart problems. “When you work with a person every day, you know when something’s not right,” Martinez said. When Wilson lost energy one day and was hanging onto the end of the counter, Martinez said he and co-workers convinced her to go to the emergency room. She was diagnosed with congestive heart failure and a failing mitral valve. She had open-heart surgery to replace the valve in Wenatchee, Washington, where her daughter, Erin, works as a surgical nurse. Almost immediately after surgery, Wilson said she noticed her energy level jumped, and within a few days, she was conquering hills around her daughter’s house on walks. Soon after, she was putting on weight. Within three months, she was back waiting tables at CJ’s. “We told her we were wrong; she wasn’t getting old,” Martinez joked. Wilson doesn’t plan to stop waiting tables anytime soon. She loves meeting people, and she thinks it keeps her in shape and up to date with a fast-changing world. Ernie and Judy Tarantino, two more regulars at CJ’s, say the restaurant is home base for catching up with what’s going on in town, and it’s Wilson who fills them in. “She knows everybody in town,” Judy said.